I’m really digging layering things up in a pan and popping it in the oven. 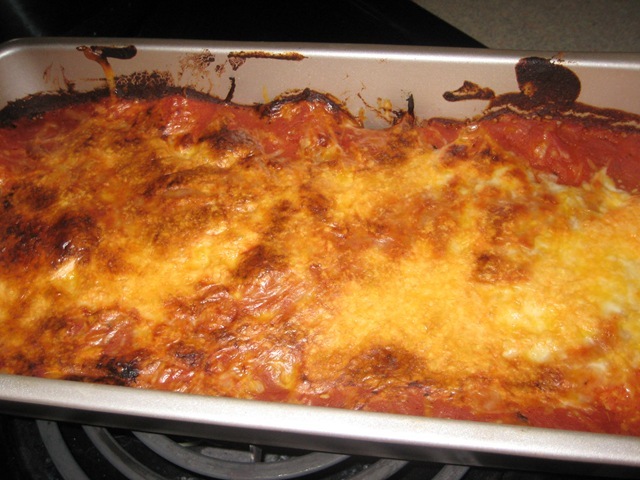 It’s just too easy to resist and all the flavors meld with each other in the oven. 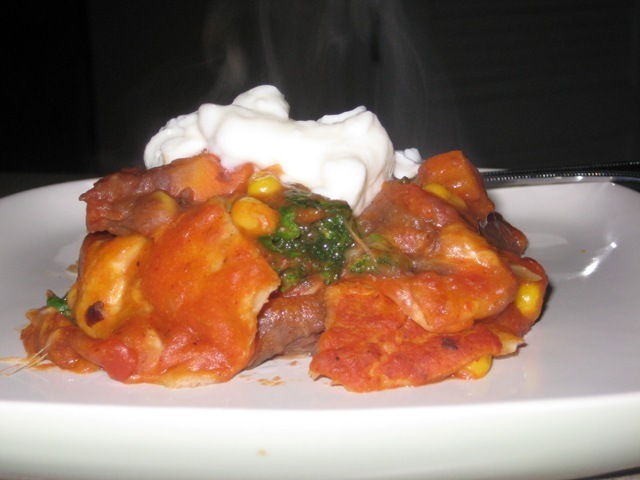 So far, I’ve had great success with it and this enchilada casserole was no exception. 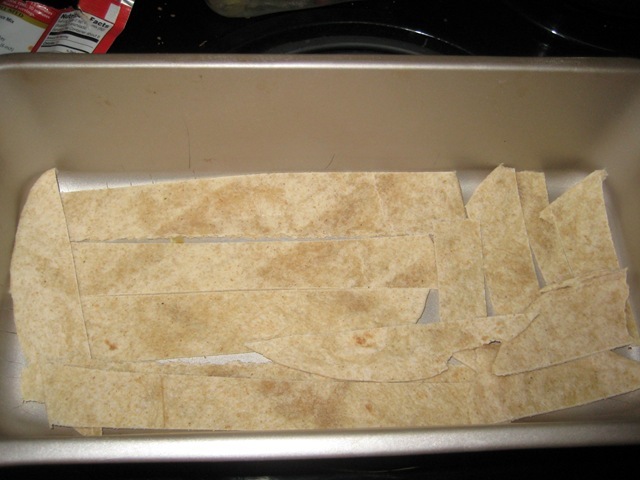 I started with layering the bottom of a loaf pan with whole wheat tortillas. I cut them into strips thinking that would be better but I’m going to go ahead and say it was not the best idea. Because the next step is spreading the refried black beans on top..which was not easy with the strips. I need to do a little more forward thinking. So once I cursed the refried and black beans for a while, I got them all spread out on the pan. Then I put a layer of sautéed onions and veggies (a frozen medley I defrosted while sautéing the onions). 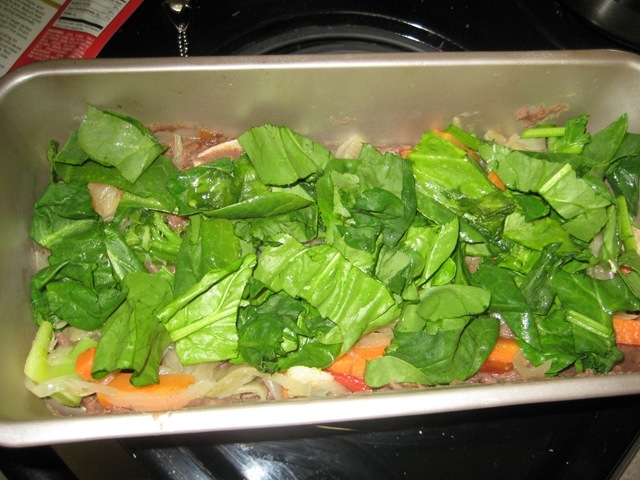 Then I chopped up some fresh spinach. 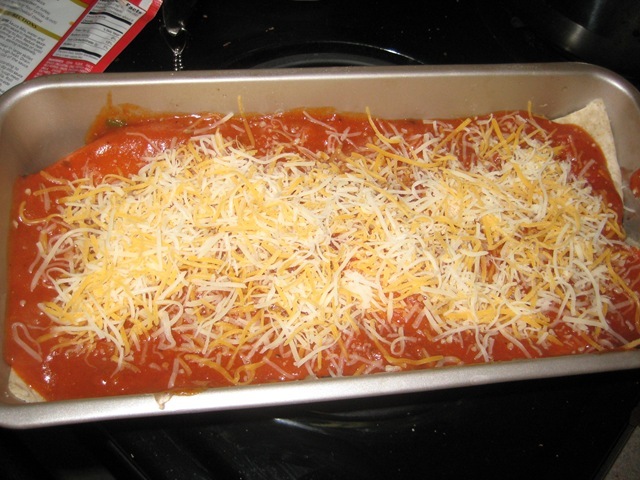 Then I poured some of the enchilada sauce on top (prepared according to the packet: spices + tomato sauce + water brought to a boil), another layer of whole wheat wraps, more enchilada sauce, and then some cheese. I covered it with some tin foil, popped it into a 400 degree oven for 10 minutes. Then I removed the foil and broiled it for another 5 minutes. 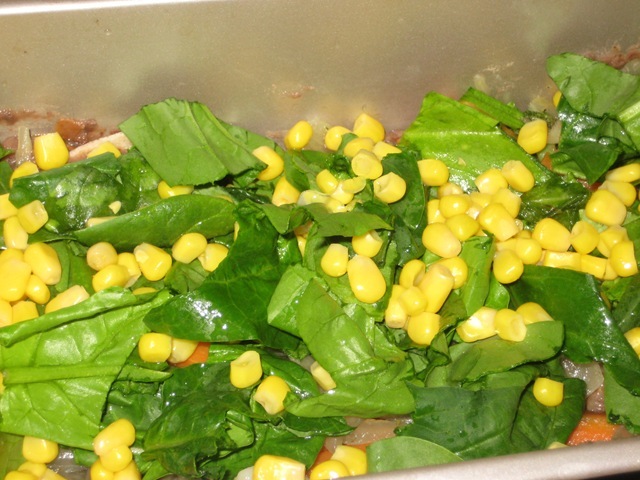 When James was looking through my pictures he told me none of the pictures of my casserole made it look edible. And I’ll tell you why. I was just too excited to eat it and didn’t wait until it cooled off to cut into it and put it on my plate. Woops! This made for some less than stellar blog photos. But let me tell you, it was good. I’m still trying to get used to working full time + running + making dinner and making sure the apartment doesn’t look like a tornado swept through it (which it kinda looks like right now). I know that it just takes getting used to and tons of people do it. I saw your question on my blog. I’m running the half. I am doing the Hal Higdon Novice marathon training plan and on week 3. Do you live in the Atlanta area? So what’s the new job?